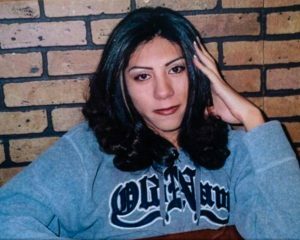 On July 17, 2008, Angie Zapata — a transgender woman — was killed in northern Colorado. Angie was murdered by a man she was dating. Angie’s killer was sentenced to life in prison plus 60 years. This was one of the first U.S. cases ever to result in a conviction of a hate crime against a transgender person. Ten years after Angie’s death, her mother, Maria Zapata, and Angie’s brother, Gonzalo Zapata, sat down to remember her at StoryCorps. Top photo: Maria Zapata and Gonzalo Zapata at their StoryCorps interview in Brighton, CO. Credit: Liyna Anwar for StoryCorps. Bottom photo: Angie Zapata. Courtesy Maria Zapata. GZ: Do you remember what Angie told you she wanted to be when she grew up? MZ: She was gonna be a cosmetologist. So Angie went to apply to cosmetology school. And they told her that she had to conduct herself as a boy. But Angie said, ’This is who I am. If you can’t accept me, then goodbbye’ That was it. I don’t know if I told you, but one time I taken Angie to, um, Walmart. We were at the cashier’s and there was this lady just looking and looking. And I said, ’What are you looking at?’ I was ready to just smack this woman. I don’t like people staring. But Angie says, ’She’s looking at me because I’m pretty.’ And Angie, when she said that, it calmed me down quite a bit. You know, she taught me a lot of stuff that I should’ve known before. I didn’t know what transgender was all about. Still, I always used to tell her, ’Be careful. I wish I could have youse in a bubble where nobody would hurt you.’ But, uh, July 17th, 2008, she was murdered. GZ: This individual used a fire extinguisher. And hit her with it. And left her there. MZ: When this had happened to my Angie, it just seemed it was me against the world, and I didn’t want to be a part of that world at that time. I just didn’t want to deal with questions, because I didn’t know the answer. But every weekend, I’ve been going to the cemetery. I carry on a conversation with Angie, and it’s my way of — of healing, I guess. They say that every day goes easier. It doesn’t. It’s like a part of my heart is gone. But there isn’t a day has gone by that she’s not missed. And that she’s not loved.